Power dressing is all about appearing confident, assertive and competent at work. To achieve this professional style, you must think carefully about the clothes and the accessories you wear. Our guide to power dressing will help you choose the best accessories for you. Old style power dressing is generally favoured by women in long-established and traditionally male-dominated professions. Think female MPs and lawyers. These professional women want to stand out from the crowd, but without going against the formal dress code or appearing too feminine. As a general rule, they wear dark designer skirt or trouser suits and matching accessories. The new style of power dressing is more flexible and modern. It is generally favoured by women in 'newer' professions and those with a less rigid dress code. This style gives professional women more scope to show off their personality. New style followers will wear more modern colourful and patterned clothing and accessories. Michelle Obama is often used as an example of new style power dressing. The wife of the new American president looks completely comfortable in what she wears and appears both smart and approachable. Whichever style you choose, accessories are an essential part of successful power dressing. Earrings, brooches, bag charms and scarves are the best power dressing accessories – they allow you to add a touch of colour to your work clothes without undermining your professionalism. Old style professionals should stick to more traditional designs whereas new style followers can opt for brighter, more modern jewellery and accessories. 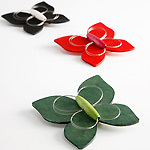 Scroll down for eco-friendly wooden earrings, brooches and bag decorations - ideal for power dressing. These clip-on earrings are ideal for professional women without pierced ears. 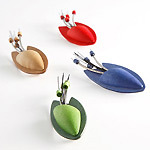 Made from sustainable wood, Turku earrings come in four colours - black, blue, green and red. Pick your favourite pair to add a touch of style to your work outfit or buy all four for variety. These butterfly clip earrings create understated elegance at work. These wooden bead earrings are great value for money at under £10 a pair and are available in black, white, jeans blue, red, apple green and dark green. Made from sustainable wood, Marja earrings are durable, lightweight and comfortable - weighing only 2 grams. This dramatic wooden brooch will add a touch of colour to a jacket, top or cardigan. 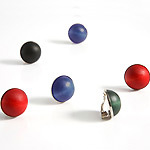 Choose from middle brown/light brown, red, jeans blue and dark green/apple green. 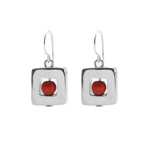 Weighing just 12 grams, this small earrings will add glamour to your work wear. Currently available in red and black, why not buy both to mix and match. 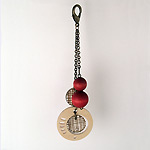 Matching red necklace also available. Jazz up your work jacket with this eye-catching wooden butterfly design. 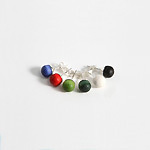 Choose from apple green/dark green, white/black and aniline red/red. 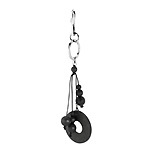 Individualise your work bag with this quirky red or black bag charm. The Kaisli bag decoration is made from green materials from Finland and weights less than 40 grams. The Rumba bag decoration is a subtle way of customizing your work bag. Look professional and stylist with this wooden Scandinavian design in mixed brown or black.